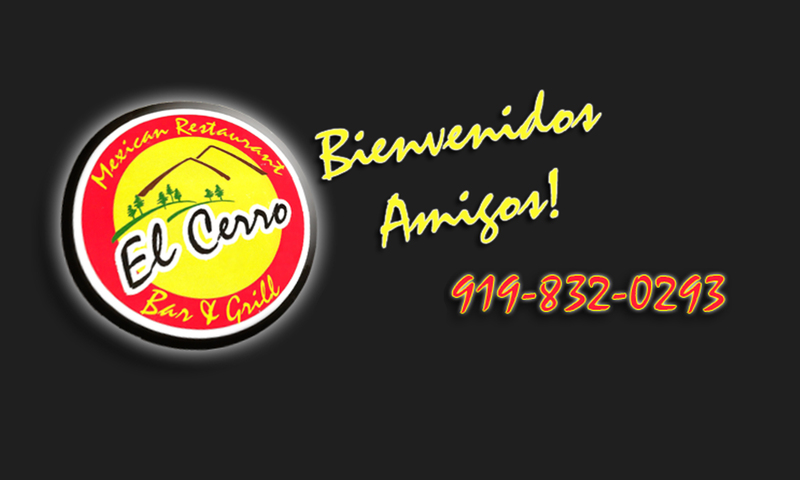 For the best Authentic Mexican food, your first and only stop must be El Cerro Bar & Grill . Since 2009, we have been serving up a Fiesta, with exciting and delicious menu items that are sure to enchant and fascinate our costumers. Conveniently located in the Raleigh, Durham area. We are a great place to let your worries go and have fun. Our staff welcome our new and returning customers and are proud to serve authentic Mexican entrees such as succulent enchiladas, juicy and tender fajitas, quesadillas, burritos and nachos all cooked to perfection and served in a friendly atmosphere. Try one of our great Margaritas, or the ever popular (Margarita Slider). Bring the whole gang to watch the game and cheer for the home team. Students bring your Id and receive 10% off your meal. Having a party no problem call us up and get it togo.